Wednesday, June 27, 2012. The drive down to the Cape felt longer because I was hungry. By the time I arrived at the house, I was less focused on where or what I would eat and more focused on eating Right Now. So when my boyfriend’s mother suggested lunch at the Outer Bar & Grille, part of the Wequassett Resort and Golf Club in Harwich, MA, I quickly agreed. The parking situation at Wequassett was less than ideal. Cape Cod’s one-way, one-lane driveways make no sense to me, and I cannot find the logic in positioning large buses that block traffic and patrons’ cars. But I digress. I was hungry. The Outer Bar & Grille is located right on the water overlooking both a swimming pool and the Atlantic Ocean. Initially we worried about sitting on the open-air deck because it was a windy day, but the staff kept a clear plastic tarp blocking the wind from interfering with the dining area. We were very happy with our table, and our view! The ambiance was relaxing. I loved the bright colors—turquoise pool, sparkling blue ocean, white boats, green landscaping. The other diners were a jumble of conservative business suits, beach-y T-shirts and capris, and sunglasses of all kinds and colors. I nursed an Arnold Palmer and nibbled on some bread. The service was a bit slow, but our waiter was very friendly and I felt satisfied chalking up the pace to warm-summer-day-on-Cape-Cod. I was tempted by both the New England four-cheese pizza (Maple Brook Farm mozzarella, Berkshire blue, Grafton Vermont cheddar, and Smith’s Farm gouda…doesn’t that sound awesome?) and the lobster-salad sandwich (recommended by a customer on our way in). I decided on the baked local haddock with spinach, broccolini, ricotta cheese, crab meat, avocado, and finished with lemon-thyme dressing. The dish was fantastic. The flavors clicked well together, and the presentation was attentive and colorful. I was very happy with my selection! 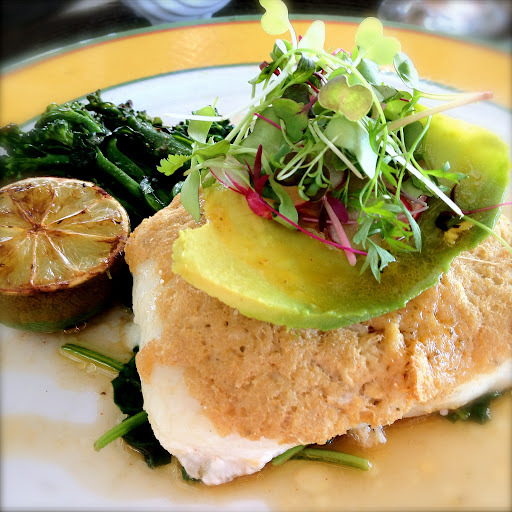 Baked local haddock with spinach, broccolini, ricotta cheese, crab meat, avocado, and finished with lemon-thyme dressing. Especially when it comes to dessert, I’m an indecisive diner. My shameful, decadent confession is that occasionally when I am feeling torn, I have been known to order two desserts. That’s what happened at the Outer Bar & Grille. And I was glad I did. 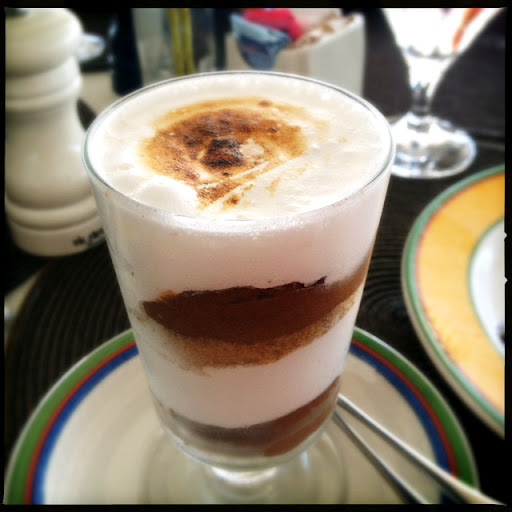 My first dessert was a quirky, pudding-style take on s’mores, with layers of marshmallow “fluff,” chocolate pudding, and graham-cracker crumbs. S’mores is one of my childhood favorites, and I thought this was a fun and yummy twist. Pudding-style take on s’mores, with layers of marshmallow “fluff,” chocolate pudding, and graham-cracker crumbs. My second dessert was “chipwich,” which is exactly what it sounds like. Oftentimes “chipwiches” are served too large, especially for dessert addicts like me who are playing make-your-own-tasting-menu, but the size at Outer Bar & Grille was a Goldilocks-approved juuust right. Between the two desserts, this one was my favorite. 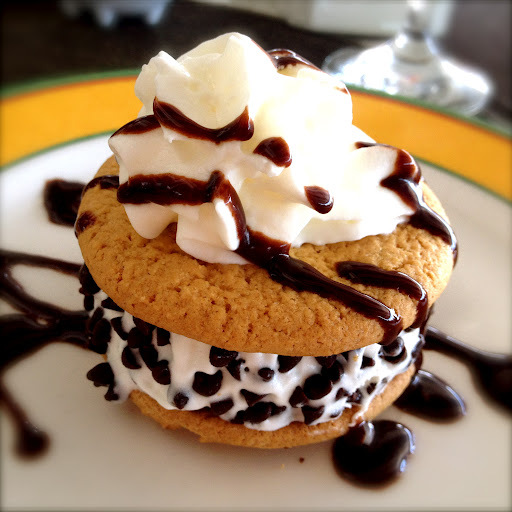 “Chipwich”: vanilla-choc-chip ice cream, sandwiched between two cookies, topped with whipped creme and chocolate sauce. Overall I felt that the meal was worth the trip, and I would return if I got the chance. Ideally on another beautiful sunny day!